A Lemmings fan who completed a live-blogged 36-hour port of his Palm OS-based version of the game to the iPhone and Palm Pre has had his moment of triumph cut short by a cease-and-desist letter from Sony. 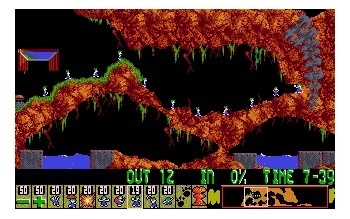 On June 22, Aaron Ardiri of mobile games developer Mobile 1Up took a unique challenge upon himself: Porting the old Palm OS implementation of the Psygnosis classic Lemmings to the iPhone/iPod and Palm Pre in as short a time as possible, while live-blogging the entire process. The project was a success; in only 36 hours, Ardiri had the game fully compiled and waiting for approval on the App Store and the Palm App Catalog, and also had Windows and Mac versions freely available on his website. Unfortunately, but perhaps predictably, everything came to a screeching halt when a cease-and-desist letter arrived from Sony, which purchased Psygnosis in 1993 and owns the rights to Lemmings. The letter gave Ardiri 48 hours to remove all his ports of Lemmings or face a lawsuit and damages for each copy of the game he distributed. Despite the premature end to his Lemmings adventure, Ardiri seemed remarkably upbeat. "As much as we would love to have this title reach everyone, we have unfortunately been contacted and instructed by Sony's intellectual property and legal department to remove our Lemmings conversion from our websites and distribution channels," he wrote on his website. "While we did this as a tribute to the game - we can only hope that Sony actually does a conversion for platforms like iPhone and Palm Pre in the near future. We will open communication with Sony to explore the rights for these platforms!"